Whiteheads (pimples) are plugged oil glands that are closed. Blackheads are plugged oil glands that are open. Reason: The oil turns black when it is exposed to air. Whiteheads and blackheads are also called "zits." Red bumps are from blocked oil glands that have leaked oil. This causes irritation in the skin around them. Larger red bumps can be quite painful. Acne skin changes are from plugged oil glands. Acne has several causes. Increased levels of hormones during puberty have a part. Heredity also plays an important role. Some skin bacteria can make it worse. Acne is not caused by diet. You do not need to avoid eating fried foods, chocolate, or any other food. Acne is not caused by dirt or by not washing your face often enough. More than 90% of teenagers have some acne. Acne is a normal part of the teen years. There is no medicine at this time that will cure acne. However, good skin care can keep acne under control and at a mild level. Benzoyl Peroxide (BP) is the best OTC medicine for bringing acne under control. Use a Benzoyl Peroxide 5% gel product (such as the store brand). OTC means no prescription is needed. It helps to open pimples and to unplug blackheads. It also kills bacteria. Apply the lotion once a day at bedtime to the area with acne. Redheads and blonds should apply it every other day for the first 2 weeks. Reason: More sensitive skin. Use an amount of lotion the size of a pea. This should be enough to cover most of the acne. If the skin becomes red or peels, use less of it. Other option: You can use it less often. Caution: Avoid the corners of the eyes, nose and mouth. Reason: These areas are very sensitive. Caution: Benzoyl Peroxide bleaches clothing, towels, blankets, etc. Apply it only at bedtime and put it on sparingly. Use a plain white pillowcase. Large red bumps mean the infection has spread beyond the oil gland. If you have several red bumps, your doctor may prescribe an antibiotic. Antibiotics come as solutions for the skin or as pills. The antibiotic will kill the bacteria that are causing the infection. Give the antibiotic as directed. Wash your skin twice a day. The most important time to wash is bedtime. Just use warm water or you can use a mild soap (such as Dove). Avoid scrubbing your skin. Reason: Hard scrubbing of the skin irritates the openings of the oil glands. This causes them to close off even more tightly. Opening (popping) pimples is not advised by many doctors. But, most teens and adults do it anyway. So, here's how to open a pimple safely without any squeezing. Never open a pimple before it has come to a head. Wash your face and hands first. Use a sterile needle (cleaned with rubbing alcohol). Nick the surface of the yellow pimple with the tip of the needle. The pus should run out without squeezing. Wipe away the pus and wash the area with soap and water. Opening small pimples in this way will not cause skin damage. Many young people pick at their acne when they are not thinking about it. Picking makes acne worse. Try not to touch the face at all during the day. Squeezing blackheads causes bleeding into the skin. The bleeding turns into brownish blotches on the skin. They can take 1 or 2 months to fade. Squeezing red lumps can force bacteria into the skin. This too leaves blotches. It can also cause a serious face infection. Avoid putting any oily or greasy substances on your face. Reason: They block oil glands and make acne worse. If you use cosmetics, use water-based cosmetics. Avoid hair tonics or hair creams (especially greasy ones). When you sweat, they will get on the face and irritate the acne. With treatment, new whiteheads and blackheads will decrease. But, it takes 6 to 8 weeks. Acne usually lasts until age 20 or 25. So, you will need to continue the treatment for several years. You don't need to worry about scarring. It is very rare for acne to leave any scars. 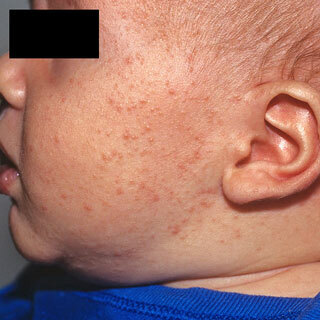 This shows baby (neonatal) acne on the cheeks and side of the face. There are red and white raised bumps.